SYDNEY (AP) — Australian police detained 15 people Thursday in a major counterterrorism operation, saying intelligence indicated a random, violent attack was being planned on Australian soil. About 800 federal and state police officers raided more than a dozen properties across Sydney as part of the operation — the largest in Australian history, Australian Federal Police Deputy Commissioner Andrew Colvin said. Separate raids in the eastern cities of Brisbane and Logan were also conducted. One person was charged with serious terrorism-related offenses and was scheduled to appear in court later Thursday. Colvin declined to detail the exact nature of the charges. The arrests come just days after the country raised its terror warning to the second-highest level in response to the domestic threat posed by supporters of the Islamic State group. Last week, Australian police arrested two men in Brisbane for allegedly preparing to fight in Syria, recruiting jihadists and raising money for the al-Qaida offshoot group Jabhat al-Nusra, also known as the Nusra Front. Colvin said the raids conducted in Brisbane on Thursday were a follow-up to that operation. It was not yet clear how the investigations in Sydney and Brisbane were linked, he said. The government raised its terrorism threat last week from “medium” to “high” on a four-tier scale on the advice of the Australian Security Intelligence Organization. The domestic spy agency’s Director-General David Irvine said the threat had been rising over the past year, mainly due to Australians joining the Islamic State movement to fight in Syria and Iraq. When announcing the elevated threat level, Prime Minister Tony Abbott stressed that there was no information suggesting a terror attack was imminent. 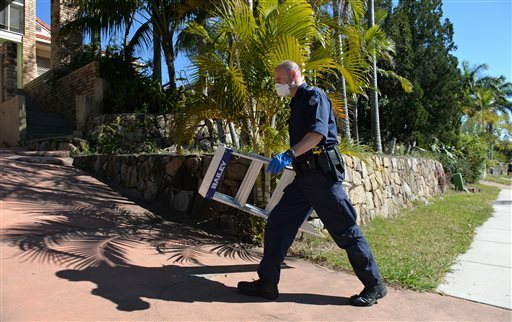 Police said raids were conducted in a dozen suburbs of Sydney and in three suburbs across Brisbane and adjoining Logan. A Muslim book shop and community center in Logan was at the center of counterterrorism raids on several properties last week. Police said at the time there was no terrorist threat to the Group of 20 leaders’ summit to be hosted by Brisbane in November which will bring President Barack Obama and other leaders of the world’s 20 biggest economies to the Queensland state capital. Australia has estimated about 60 of its citizens are fighting for the Islamic State group and the Nusra Front in Iraq and Syria. Another 15 Australian fighters had been killed, including two young suicide bombers. The government has said it believes about 100 Australians are actively supporting extremist groups from within Australia, recruiting fighters and grooming suicide bomber candidates as well as providing funds and equipment.